"Lifting the [#Cuba] #Embargo doesn't set back freedom; it advances freedom," says Hillary Clinton on the campaign trail at Florida International University in Miami this week. Miami may be a dangerous place politically to make such a statement, Rubio's home ground, where many Cuban exiles and their families stand by the long-entrenched hard line against any connection between the U.S. and Cuba. But FIU is the place to make such speeches. We of Cuba Libre Today were at FIU when Yoani Sanchez, famous dissident blogger and Havana, Cuba resident, spoke there, to not-too-much criticism from the Cuba exile community. Anticipating Clinton's promotion of eliminating the blockade, Rubio said, "President Obama and Secretary Clinton must learn that appeasement only emboldens dictators and repressive governments and weakens America's global standing in the 21st century." The quotes and the rest of the story come from Bill Barrow's Associated Press (#AP) article, "
In swing state Florida, Clinton calls for Cuba embargo’s end," printed on August 1, 2015. "MIAMI — Drawing a sharp distinction with her main Republican rivals in Florida, Hillary Rodham Clinton on Friday called on the GOP-run Congress to end the trade embargo the U.S. has imposed on Cuba since 1962. The Democratic presidential favorite said an open economic relationship would do more to bring “dignity and democracy” to the island nation than continuing the hardline isolationism that lasted through five decades of Republican and Democratic administrations, including her husband’s two terms. 'They have it backwards: Engagement is not a gift to the Castros; it’s a threat to the Castros,' Clinton said. 'An American embassy in Havana isn’t a concession; it’s a beacon. Lifting the embargo doesn’t set back freedom; it advances freedom.'" The article also quotes Clinton as saying, "We cannot afford to let out-of-touch, out-of- date, partisan ideas and candidates rip away all the progress we’ve made." "U.S.-Cuba relations have long been a flashpoint in Florida politics. The generations of Cuban-Americans who were born in Cuba and fled shortly after the Castro-led revolution in the late 1950s generally supported a hard line, including the embargo that keeps American businesses from trading with Cuba and blocks Americans from traveling in the country and spending money there as tourists. For decades, south Florida politicians and presidential candidates vying for the state’s electoral votes reflected those views, regardless of party. Clinton’s husband was among them, even as he quietly attempted to engage Fidel Castro in the 1990s. Now, says Florida pollster Fernand Amandi, an expert on Cuban-American public opinion, that once solid voting bloc is 'a community in transition,' giving Clinton an opening." The article states that outside the Cuban-American community, "a majority of adults in the U.S. support normalizing relations with Cuba. A Pew Research Center survey conducted July 14-20 found that nearly 73 percent of Americans approve of establishing diplomatic relations with Cuba, while 72 percent support ending the trade embargo...." And it states that even Republicans support of the actions has increased since first implemented, and exceeds 50% in support. Is Clinton's promotion a political death-knell, at least in the Miami community? We'll see. Plenty have nothing good to say about Clinton, and this is a hot topic for her opponents to pin on the negative list. We at Cuba Libre Today agree with eliminating the Blockade. 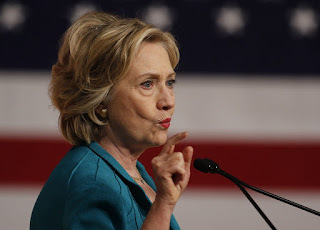 Photo from PBS version of the AP article, which gives credit and states as follows: "Democratic U.S presidential candidate Hillary Clinton makes a speech on Cuban relations at Florida International University in Miami on July 31, 2015. Clinton on Friday called for the U.S. Congress to end the U.S. economic embargo in Cuba and said she would make it easier for Americans to travel to the Communist-led island if she were president. Photo by Joe Skipper/Reuters."